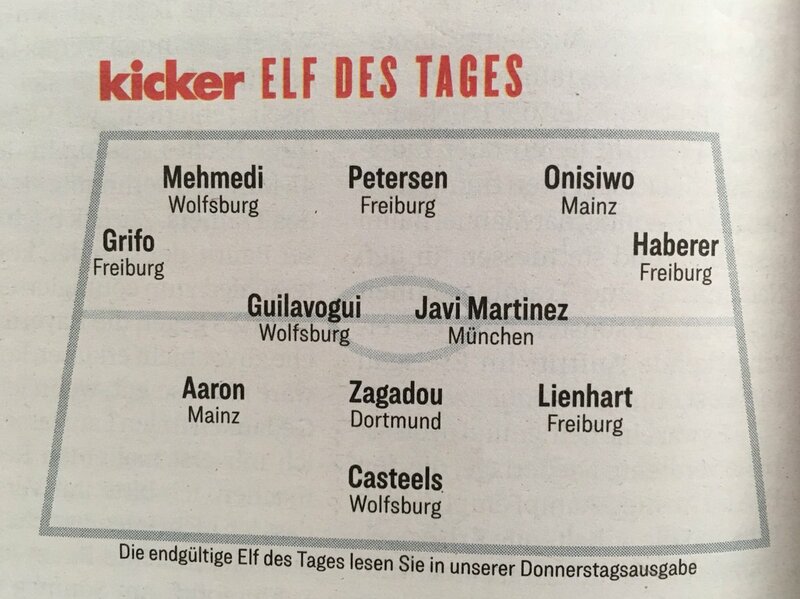 Here is the Bundesliga Team of the Round from FOUR different German media sources for GW29 for April 2019. 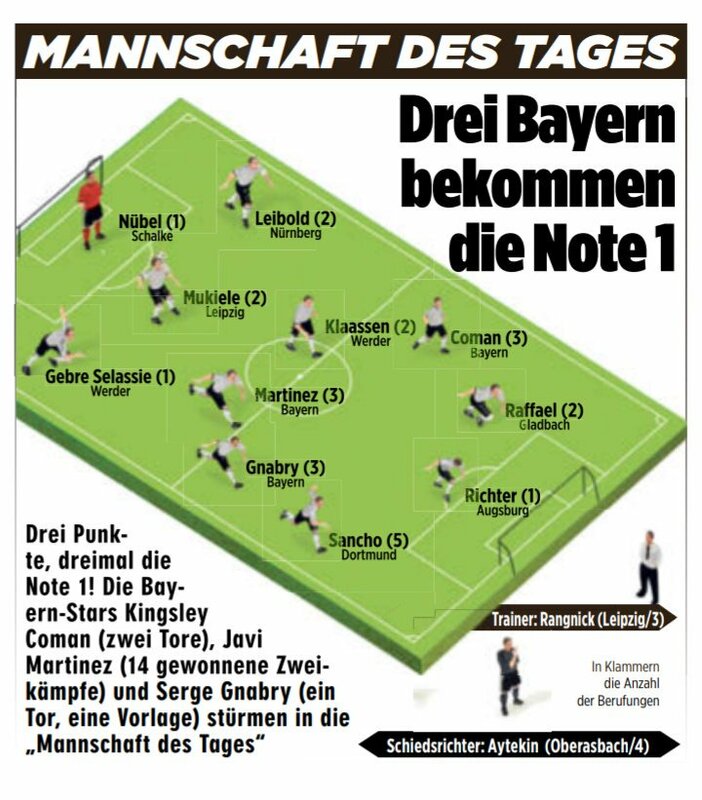 The common names from all four lists?- The Bayern duo of Coman and Gnabry, who shone in their 4:1 win over Dusseldorf and England forward Jadon Sancho, whose brace kept Dortmund in the title race with a 2:1 win over Mainz. While there is no German side left in the Champions League, there are still plenty of players with German ties in the compeition. The Man City duo of Ilkay Gundogan and Leroy Sane are both German while Pep Guardiola managed Bayern Munich before moving to England. City were knocked out Spurs in a game for the ages last night. 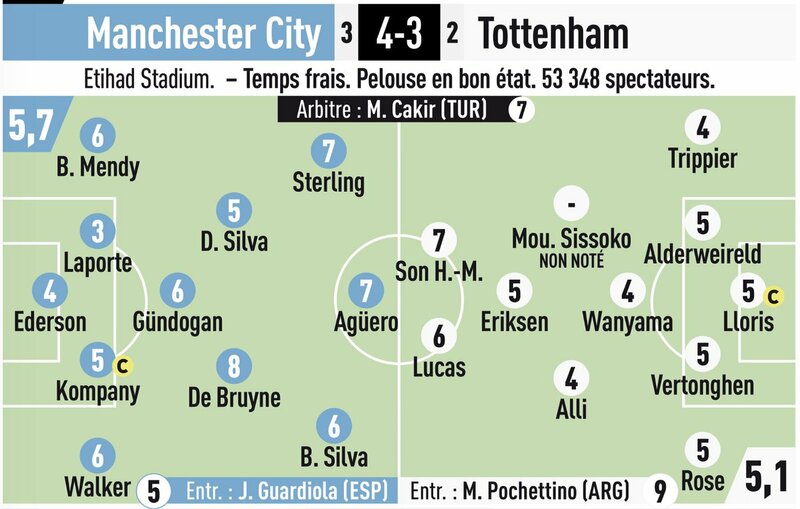 L’Equipe tend to be very harsh with their ratings, but gave Mauricio Pochettino a 9/10 for this. 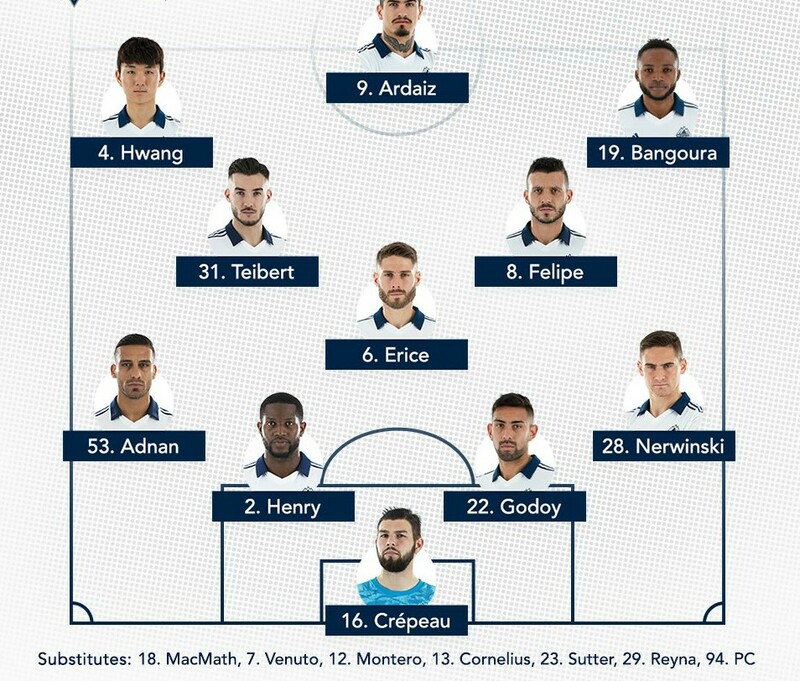 We thought the Argentine did a decent job tactically, but perhaps not a 9/10 L’Equipe style one, and that the Llorente for Sissoko sub wasn’t the best one. His opposite number got just a 5. Borussia Dortmund just about kept themselves in the race for the Bundesliga title with a 2:1 win over Mainz over the weekend. The win, while not as impressive as Bayern’s triumph over Dusseldorf, still ensured that BVB are just a point behind the Bavarians. 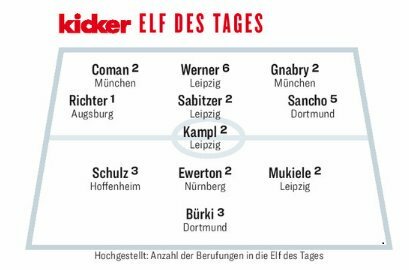 The ratings from Kicker show that England forward Jadon Sancho, who scored both of BVB’s goals, and Swiss goalkeeper Roman Burki, who made an amazing late triple save to deny the visitors, were the best Dortmund players on show. The worst were Diallo and Brun-Larsen, both of whom got 5’s for their showing. A slightly improved performance from the 5:0 thrashing the week before, but perhaps not at the level that you’d want from a title-winning side at this stage of the season. Maybe Bayern should organise fights between their players before every game? Winger Kingsley Coman was involved in an altercation with striker Robert Lewandowski in training prior to the trip to Dusseldorf- they came to blows before teammates Niklas Sule and Jerome Boateng separated them. French winger was the star of the show here at the Merkur Spiel Arena as he helped the Bavarian giants win 4:1. The victory took Bayern top of the table (Dortmund had beaten Mainz 2:1 on Saturday), and left them one point ahead of BVB with five games to play. Fellow winger Serge Gnabry was equally impressive as was midfielder Javi Martinez. It was a poor day at the office for Dusseldorf- their highest rated starting player was former Bayern goalkeeper Michael Rensing, and he conceded four, which tells a story in itself! The only real downside to the game would’ve been the injury to keeper Manuel Neuer, which is expected to keep him out for the next few weeks. Eintracht Frankfurt had their 15 game unbeaten streak snapped as they lost 4:2 to Portuguese giants SL Benfica in the first leg of their Europa League quarterfinal. Eintracht, the last remaining German team in European competition this season following Bayern, BVB and Schalke’s exits from the Round of 16 of the Champions League, had last lost back in December 2018 to Bayern, but were well beaten at the Stadium of Light, with young Joao Felix announcing himself on the world stage with a hat trick. Felix had three goals and an assist (check out his second goal if you can- an absolute screamer). Luka Jovic had scored against his parent club to make it 1:1, but Benfica netted in the 43rd, 50th and 54th minutes of this clash to put the result of the game beyond doubt. It’s not all gloom and doom for Frankfurt though- their two away goals have kept them in the contest. A 2:0 in the return leg will do very nice, and so would a 3:1. Felix became the youngest player to score a Europa League hat trick. There were more than a dozen clubs who sent scouts to watch this game, including several big Premier League ones (United, Chelsea, Spurs, Arsenl and Leicester), and his performance here would’ve caught the eye of many. He has a €120m release clause in his contract, but there’ll be plenty willing to stump up that fee if he continues to progress at this level. How are the Whitecaps faring in the MLS? Alphonso Davies is slowly settling into the Bundesliga, but how are the Whitecaps, the club that Bayern signed him from, faring currently in the MLS? Davies was the club’s player of the season last year. The Vancouver outfit have had a horror start to the 2019 Major League Soccer season and currently sit second from bottom in the overall table. They struggled in pre-season as well, failing to win any of their games, and that form, it seems, has extended into their regular MLS campaign. That’s four defeats and one goalless stalemate for one point from 5 games (0-1-4 record). 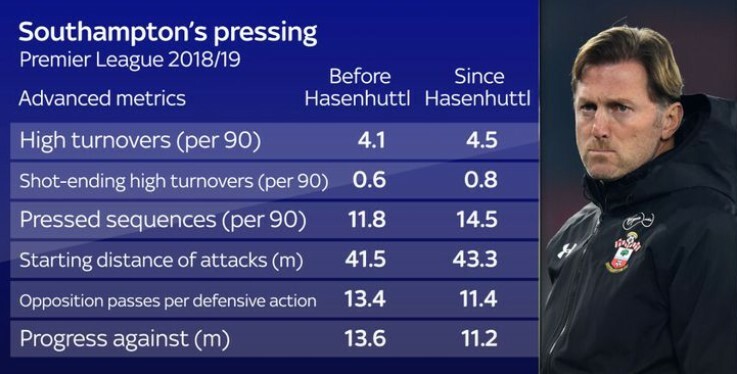 Southampton manager Ralph Hasenhuttl has said that every team in the Premier League top six are of the same standard as Bayern, and added that playing them home and away was the equivalent of locking horns with the Bavarian giants twelve times in a year! The Saints boss also said his team were the equivalent of Mainz, Freiburg or Augsburg- a level below the top six and a second tier of clubs. Southampton aren’t free from the drop zone at the time of writing, but should survive, with the last axe of relegation most likely to fall on Cardiff. The Bundesliga as a competition has struggled in recent years- Bayern, Dortmund and Schalke all lost to English opposition in the Round of 16 of the Champions League, and there was no German club in the last eight of the competition, as compared to the four English clubs that did make it. Bundesliga Team of the Week- Round 27- No Bayern players in TOTW! 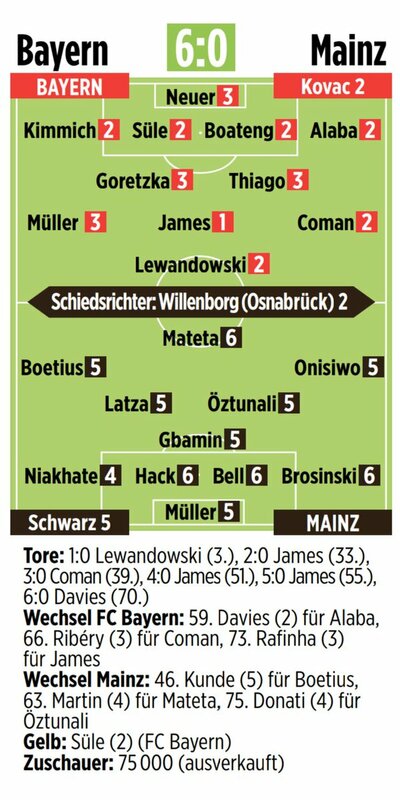 No Bayern players in the Bundesliga Team of the Round. We don’t see that happen often, but this weekend was one such occasion, with Niko Kovac’s side producing a lacklustre performance away at Freiburg. The SCF-FCB game ended in a 1:1 draw. Freiburg did have one representative though, in the form of left back Christian Gunter. The most dominant team in Game Week 27’s Team of the Round was Hoffenheim, who had three nominations thanks to their 4:1 win over Leverkusen. Ishak Belfodil, who netted a brace was one of them, along with Benjamin Hubner and Kevin Vogt. 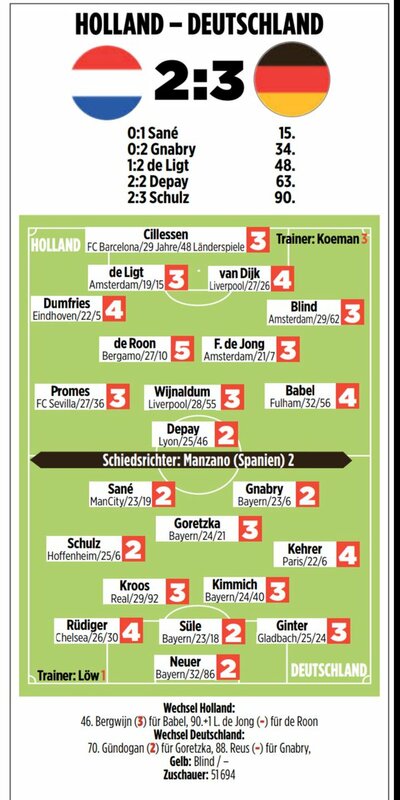 Dusseldorf’s stunning 3:1 win over Monchengladbach saw Benito Raman and Mathias Zimmermann named in the TOTW. 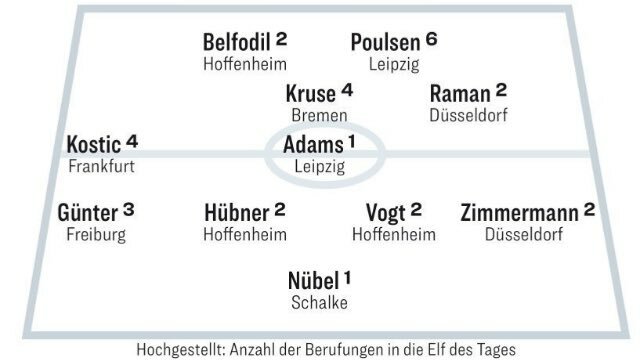 Yussuf Poulsen’s hat trick for Leipzig in their 5:0 win over Hertha earned him a nomination alongside Tyler Adams. Barcelona take on Manchester United in the UEFA Champions League quarterfinals. The two footballing giants will clash on April 10th at Old Trafford with the return fixture two weeks later at Camp Nou. It’s perhaps the tie of the round- the Nou Camp is a fond venue for many United fans, just as Istanbul is for Liverpool and Munich is for Chelsea fans. It was here that United won their 1999 Champions League crown, with current manager Ole Gunnar Solskjaer, then a player for Sir Alex Ferguson’s side, coming off the bench to score the winner deep into extra time. How did Germany and Joachim Low’s first international game after the axing of key Bayern trio Muller, Hummels and Boateng go? Die Mannschaft drew 1:1 with Serbia. The visitors took the lead through Luka Jovic, who plies his trade in the Bundesliga with Eintracht Frankfurt. FCB medio Leon Goretzka, a sub for Julian Brandt, equalised for the home side. 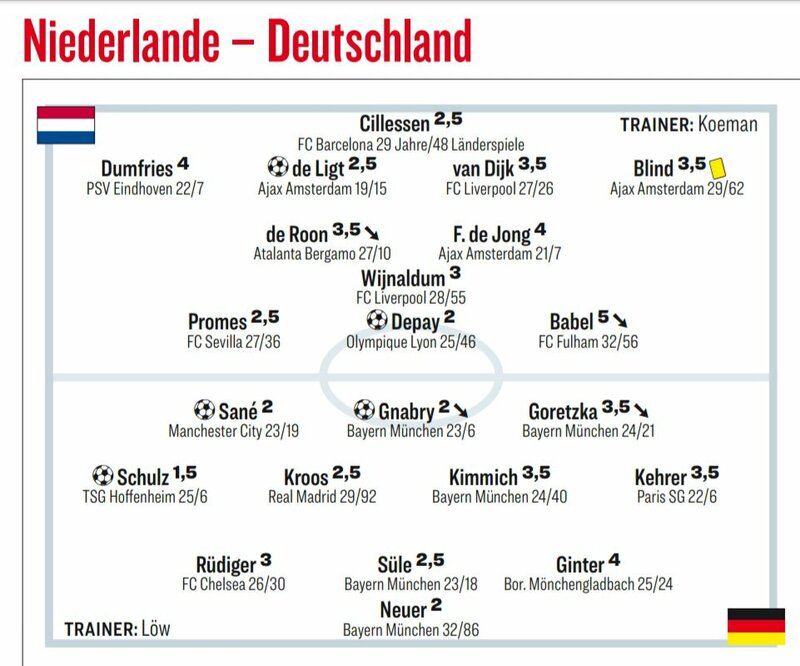 Most of Germany’s starting lineup, bar Sane and Gundogan didn’t do very well. Serbia’s starting XI certainly did better than their German counterparts, but Marco Reus and Goretzka both had positive impacts from the bench for the home side. The worst player on the evening went to Milan Pavkov, the Serbian second half substitute who saw a straight red in second half stoppage time for a horror tackle on Sane. 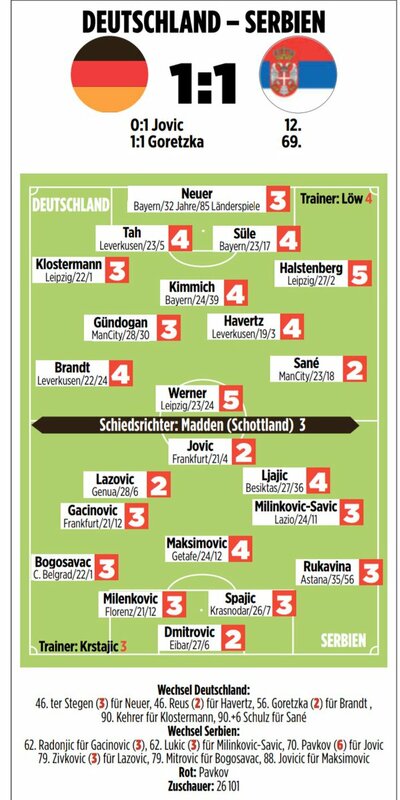 Ratings for Germany 1:1 Serbia below. Germany’s next game is against the Netherlands in Amsterdam on Sunday. 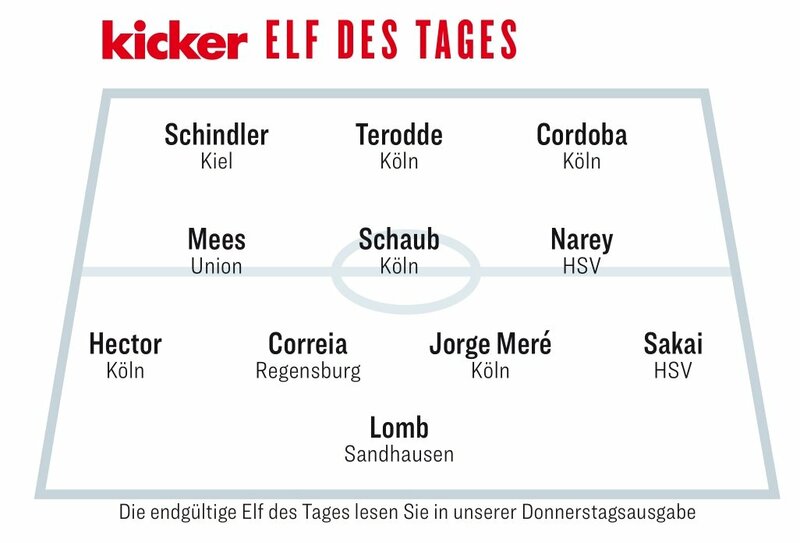 There were goals in every game in Round 26- the last of the Bundesliga before March’s international break, and here we take a look at the Team of the Round, as nominated by the German media. It was a pretty evenly distributed team. 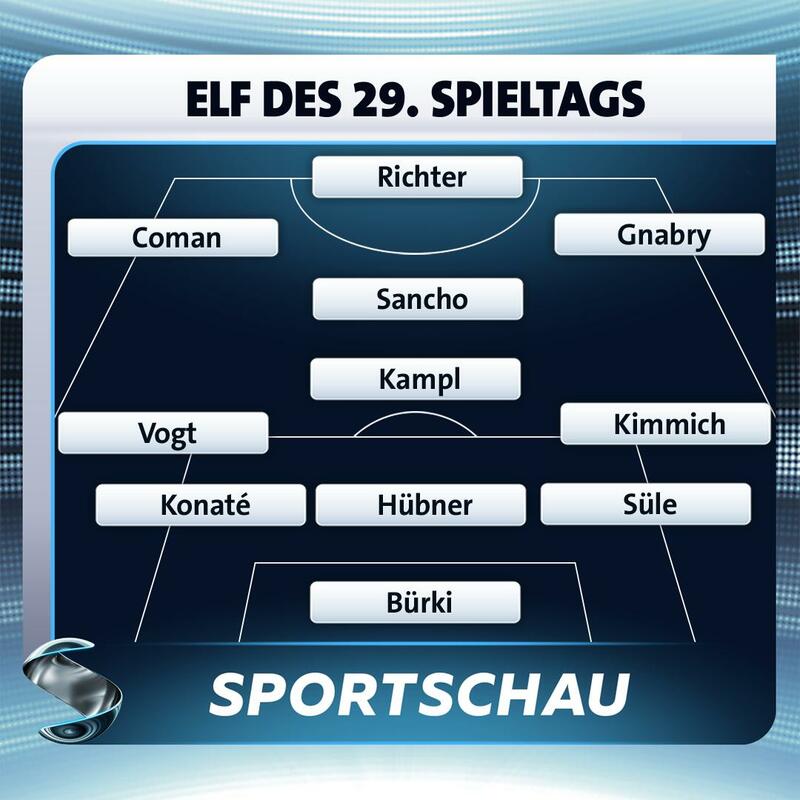 Wolfsburg and Hertha both had two representatives while seven other teams had a single player. 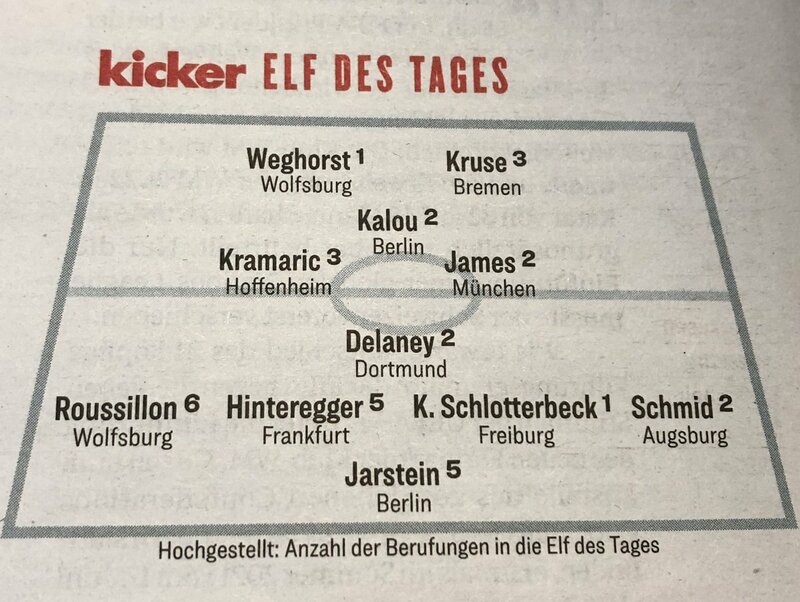 Hertha were on the losing side against Dortmund, but had goalkeeper Jarstein and forward Kalou in the TOTW. Wout Weghorst scored a hat trick for Wolfsburg in their 5:2 win over Dusseldorf. Schalke’s struggles continued as they lost to Leipzig. Birthday boy Max Kruse scored twice for Werder as they beat Leverkusen. The latter are now four points behind Eintracht and are only ahead of Wolfsburg on goal difference. Bayern bounced back from their midweek Champions League exit at the hands of Liverpool as they beat Mainz 6:0 at the Allianz Arena. The victory saw the Bavarians remain top of the Bundesliga going into the international break. Bayern coach Niko Kovac made several changes to the side that had been knocked out of the Champions League. Joshua Kimmich and Thomas Muller, both suspended for Liverpool’s visit, came back into the starting XI. Defender Mats Hummels and midfielder Javi Martinez made way for Jerome Boateng and Leon Goretzka respectively, while Kingsley Coman was preferred on the left wing to veteran Franck Ribery. It took Bayern just three minutes to open the scoring, with Robert Lewandowski beating Alexander Hack to Alaba’s near-post cross. They doubled their lead after half an hour- Goretzka chested the ball into the path of James, who netted from close range. An exquisite individual strike on the counter from Kingsley Coman made it 3-0 on 39 minutes and the game was as good as done by half time. With Zidane returning to Real, James may not have a future at the Bernabeu, and the Colombian appeared to make a case for staying at the Allianz by scoring his first ever Bundesliga hat trick. 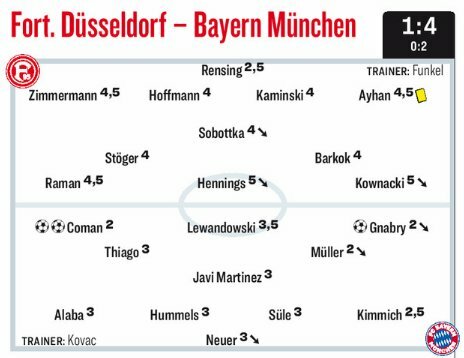 He netted in the 51st and 55th minutes to make it 5-0 to Bayern, and was also Bayern’s best player on the afternoon as seen in these Bild ratings. 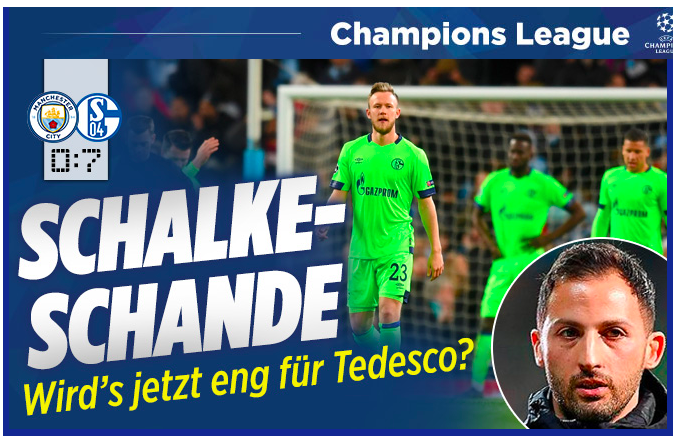 “Schalke-Schande” (Schalke Shamed), read German newspaper Bild’s headline after the game, and it was pretty much on point as the Royal Blues were thrashed 7:0 by Pep Guardiola’s men in the second leg of their Champions League tie at the Etihad. Given their domestic woes in the lead up to this game, few would’ve expected Schalke to progress, but even fewer would’ve expected them to capitulate the way they did at the Etihad- the biggest ever defeat for a German side in the Champions League era. For thirty minutes S04 kept City at bay, but once referee Turpin pointed to the spot after Bruma had fouled Bernardo Silva, the floodgates opened. Aguero scored the first (with a cheeky panenka we must add! ), and the goals kept coming. The Argentine scored two, with five different players on the scoresheet for the other goals. 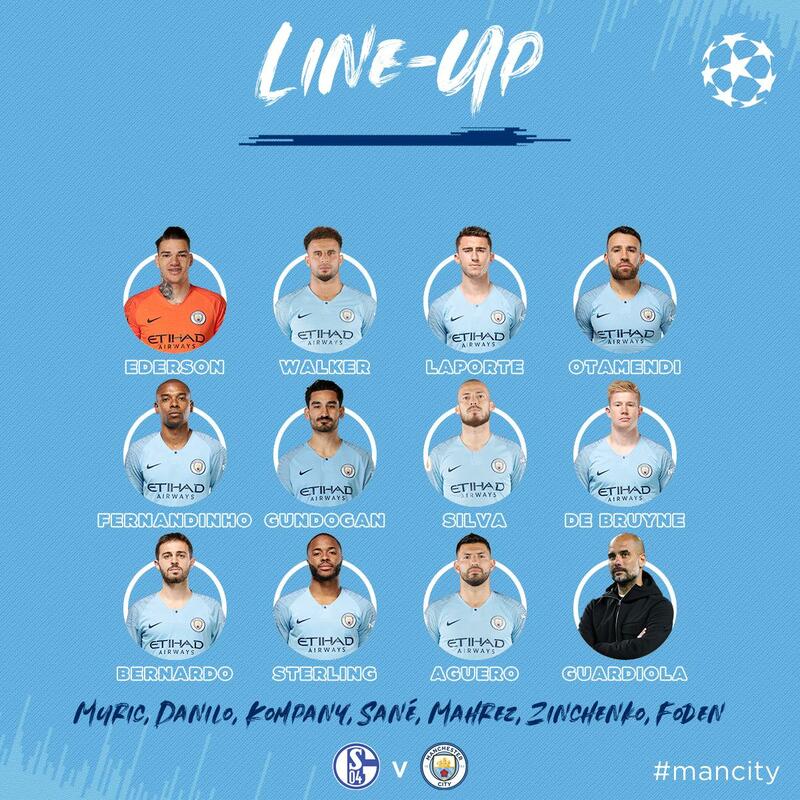 City had thrashed Shakhtar Donetsk 6:0 in the group stages, and went one step better here, as they scored 7 against Domenisco Tedesco’s helpless side. 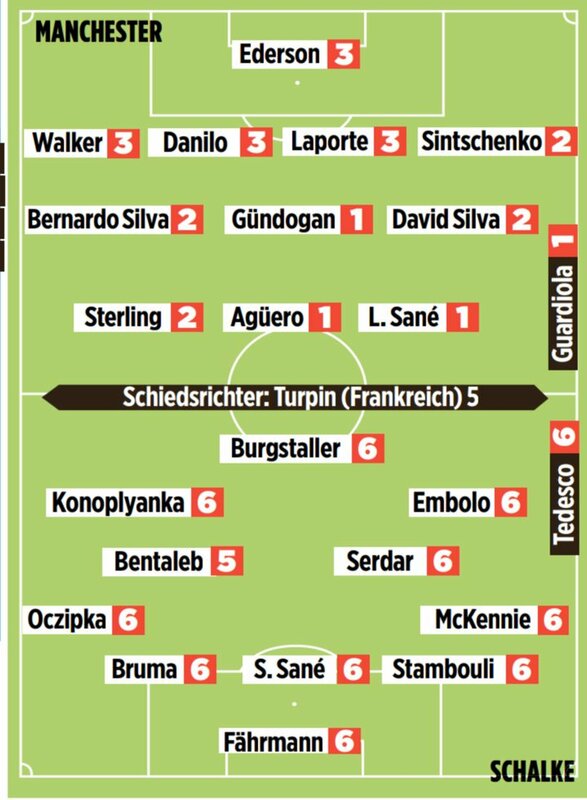 The player ratings for the Schalke team also indicated how badly they were outclassed at the Etihad. (6 is the worst, 1 is the best). The 51.518 City supporters present were treated to an attacking masterclass from their side, who could do the quadruple this season. Video Declan Rice celebration after goal vs Newcastle! Only two teams lost at home in Round 24, and one of them was Borussia Monchengladbach, who slumped to a 3:0 loss to Wolfsburg. Having taken just a point out of their last three games, third place Gladbach have lost ground on Bayern, with the gap between the two increasing to five points. Leipzig squandered a golden opportunity to leapfrog Gladbach as they drew 1:1 at home against Hoffenheim. Elsewhere, Schalke’s struggles continued with a 3:0 away loss at Mainz. The highest scoring game was at Freiburg, who hammed Augsburg 5:1 at home. 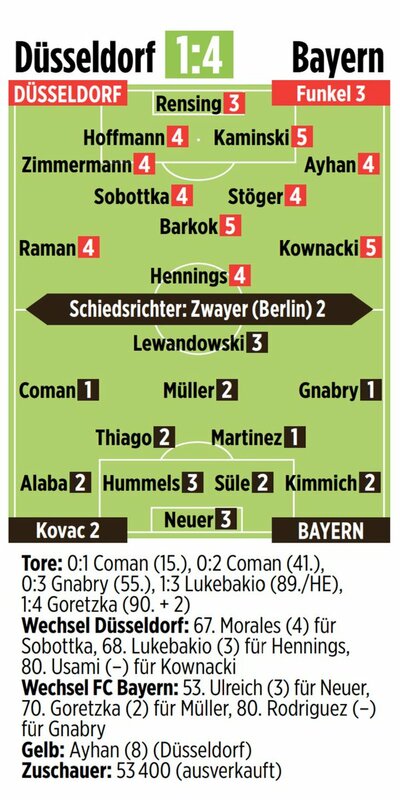 Perhaps comes as no surprise then that Sandro Schwarz’s men, along with the Wolves, dominate the Team of the Week. When the draw for the Round of 16 was made, few would’ve expected Schalke as the team to come closest to winning their first leg tie. S04 were up against mighty Man City, who had trampled all over Maurizio Sarri’s Chelsea, winning 6-0 a few days before their trip to the Veltins Arena. Schalke were five minutes away from causing a massive upset before a superb free kick from Leroy Sane and a Raheem Sterling goal (set up by City goalkeeper Ederson!) saw the Royal Blues suffer heartbreak. With City having won in Germany (with ten men too!) and scored three goals as well, the odds are against S04. Schalke were the only German team to have their first leg tie at home. Both Bayern and Dortmund had to travel to England. Bayern prevented Liverpool from scoring, and as pointed out by this LFC fan blog, would probably be the happier side- they prevented the Reds from scoring, and a victory at the Allianz should seal the deal for them. Curiously enough, Bayern have travelled to Anfield thrice. Dortmund were probably the most disappointing of the trio as they were well beaten by Spurs at Wembley. They lead the Bundesliga currently, but didn’t play like BuLI leaders against Pochettino’s men and crumbled to a 3-0 loss that has all but ended their chances of progressing to the last eight. 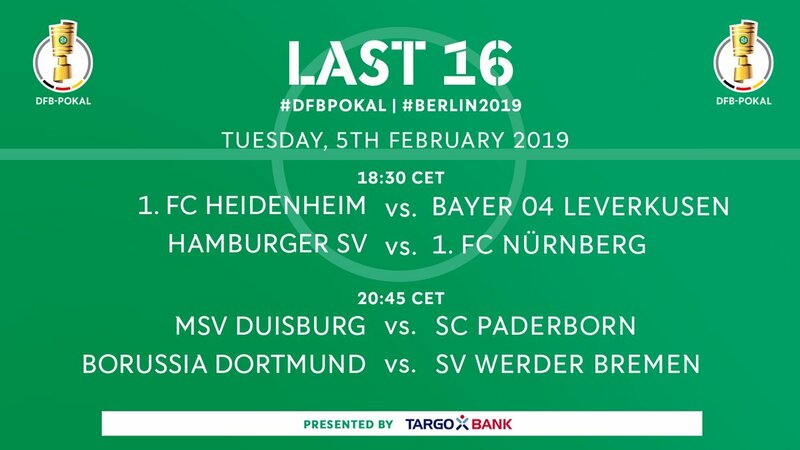 Here are the list of games to be played in the Round of 16 of the DFB Pokal, as well as their kick off timings. Fixtures to be played in February 2019 (5-6 Feb). Heidenheim, HSV, Duisburg and Dortmund will be hosting games on the 5th, while the 6th sees Kiel, Leipzig, Schalke and Hertha play host. Bayern interested in Arsenal’s Ramsey? According to reports from England, Bayern Munich are considering a move for Arsenal star Aaron Ramsey. The Welsh medio is out of contract at the end of the season and the Bundesliga side will apparently attempt to contact his representatives in January- only English clubs are prevented from approaching him till the summer. Whether Ramsey would get plenty of game time at Bayern, who have a fair number of good medios in their ranks, is another question altogether. Ramsey has also been linked with Manchester United and Liverpool. Four German teams were in action as the group stages of the Champions League kicked off this week. Bayern, Dortmund and Hoffenheim were all on the road, with Schalke the only German team to enjoy home advantage. Bayern and Dortmund both won their away fixtures, while Hoffenheim squandered the lead twice in Kharkiv to draw with Shakhtar. S04 failed to make home advantage count as they were held by Porto at the Veltins Arena. A good result for Bayern, beating Portuguese giants Benfica in front of a 60.000 strong crowd at the Estadio da Luz. A draw is a fairly good result for any team travelling to Shakhtar, but Hoffenheim would probably feel they squandered two points here. More importantly, their next opponents are Man City, who will be out for blood after being upset by Olympique Lyonnais at the Etihad. Perhaps a reflection of the faith (or the lack of it!) 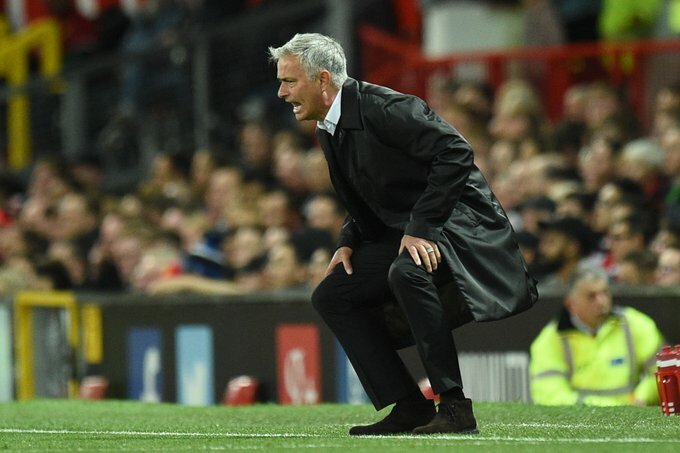 that Jose Mourino has in Eric Bailly and Victor Lindelof. The duo were criticised by fans for their role in the second round defeat against Brighton and Mourinho, wanting to play 3 at the back, opted to ask Ander Herrera, normally a central midfielder by profession, to play alongside Chris Smalling and Phil Jones. It didn’t matter- United’s defence continued to be poor, none more so than for Spurs’ third goal and Lucas Moura’s second, when the Brazilian sent Smalling straight back to Maidstone United, with the latter failing miserably in a one on one situation. That’s not how United defenders of the past would’ve performed, and it indicates how badly things have fallen at Old Trafford. Champions Bayern Munich kicked off the new Bundesliga season with a hard fought 3-1 win at home over TSG Hoffenheim. The fixture, which saw late drama with VAR being involved, also had Kingsley Coman stretchered off, with fears that the French international could be set for a long stint on the sidelines. 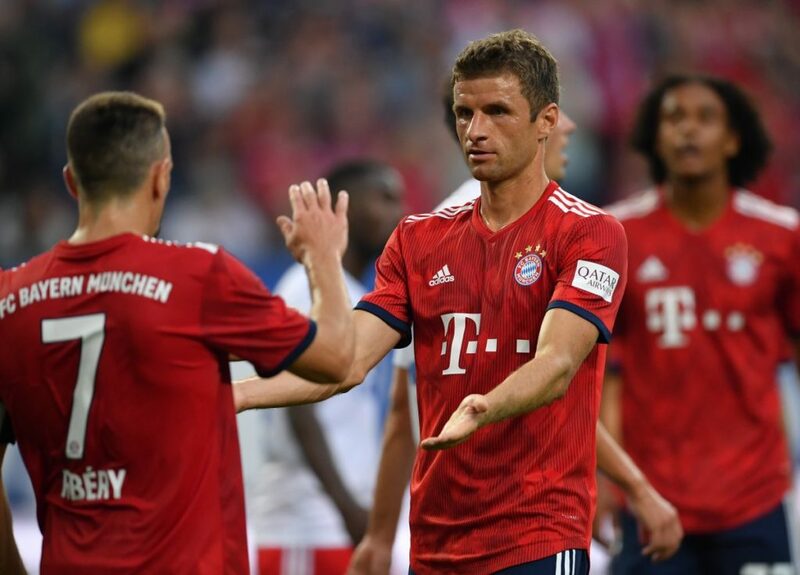 The game, Niko Kovac’s first BuLi one in charge of Bayern, saw the home side go ahead in the 23rd minute when Thomas Muller headed in Joshua Kimmich’s pinpoint corner. Adam Szalai’s low, drilled finish, aided by some lethargic Bayern defending, brought Hoffenheim level just before the hour mark. Szalai, for those not in the know, is a former Liverpool player- the Reds are themselves in action tomorrow night against Brighton, a game they’re expected to win. There was however late drama when Robert Lewandowski converted from the spot seven minutes from time to put Bayern ahead. He had missed the original spot kick, but was asked to retake it- a VAR decision, and made no mistake from the second attempt. Hoffenheim, deflated, were then caught out by a quick throw in, with Arjen Robben capitalising to give the hosts a 3:1 win. A late goal from Marcos Alonso condemned Unai Emery to the second straight defeat of his Arsenal managerial career as the Gunners went down 3-2 to Maurizio Sarri’s Chelsea at Stamford Bridge. Star Man City playmaker Kevin de Bruyne is set for a stint on the treatment room after injuring his right knee in training. The extent of the injury is unknown, but initial estimates suggest that De Bruyne would probably miss the next two months of City’s season. He is expected to be treated by Dr Ramon Cugat in Barcelona.